Focusing on what we are thankful for is always uplifting and helpful on keeping us on the right track. When our lives are filled with appreciation and thankfulness we feel joyful and happy. So . . . what better time to begin this kind of daily practice but at Thanksgiving time! One activity that I feel is a great Thanksgiving meal activity is when the family or participants each tells something that they are feeling thankful for. This can be done with a variety of “starter statements”. Pick what you feel best fits your family or gathering of people. You can combine some of these above statements or make up your own ‘starter statement’. You will probably know what might work best for your family or gathering. I would also suggest that you be the one to start the process to get it going. You can even set up another member of two ahead of time who would be willing to share to get things going. You can alter this statement to focus on whatever you feel is most fitting for your family or gathering. Here are three more concrete, fun ways to express feelings of thankfulness during Thanksgiving. Create a paper turkey and cut out some paper feathers for folks to share their feelings of thanks by putting them on the feathers and then attaching them to the turkey. Folks can write what they are thankful for and then sign at the bottom of the statement written. 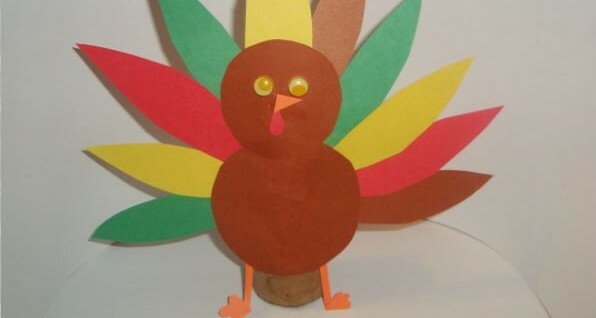 OR create a turkey with a base in which everyone can stick feathers that are attached to toothpicks into it. Folks can use the feathers to fill in things they are thankful for. Another possibility would be each person creating their own turkey and placing their own collection of feathers in it. The base for these kinds of projects can be an apple or pear or pinecone or anything that makes you think of a base for a turkey. Or you could have a turkey making table with a variety of food pieces or craft materials to create a turkey, along with feathers to create the thankful thoughts. I can see a fun creative activity for kids and adults alike. Use butcher paper or some kind of roll paper to cover your Thanksgiving tables and have crayons available for children and adults to draw pictures or write on your paper cloth what they are feeling thankful for. Another option might be each person making a Thanksgiving placemat with their thankful thoughts or pictures on it. Have a tent name tag at each place setting at your Thanksgiving table and have each person write their name on one side and what they are thankful for on the other side. They can add their own decorative work to their name tag. This could be done before the meal or during. 1.These activities can be done as a couple too. Sometimes we feel these kinds of activities have to be done in a larger group. They actually can be done very well in a small group or couple format just as well. In fact, you may find more personal feelings of thankfulness coming out of these smaller groups. 2. 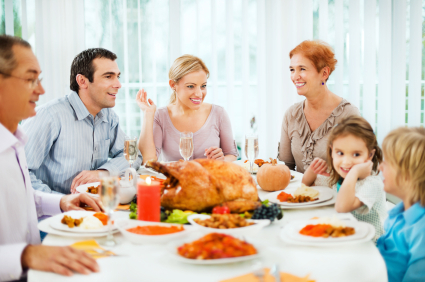 The verbal sharing of what we are thankful for can be done as an ongoing activity at your mealtimes or other group activities, such as weekly family meetings, etc. You could choose one night a week, for example each Wednesday night or every Sunday night or whatever meal you all share together on a regular basis will work. This can be so much more than just a Thanksgiving activity, but a ritual of being thankful for what we are blessed with. Hope you have an opportunity to verbalize your feelings of appreciation and gratitude on a regular basis with your family. It has a way of creating more good things in our lives. So here is to remembering our blessings!